At a February 23 Forum activists from Newark and around New Jersey voted to run independent candidates in the upcoming assembly races as part of advancing the movement for Jobs and Equal Rights for All. Come to this assembly to democratically discuss and decide on our platform and select our candidates to run in the 2019 assembly race. End all deportations, end all detentions, end all violations of due process rights, end all limits on the right to vote, to unionize, to organize and to strike. Freedom of movement for all. We will not be pitted against each other to fight for a share of too few, underpaid jobs. Providing quality free education, health care, transportation, housing and clean energy will also provide good jobs for all. It will be a big step towards a democratically-run economy-- a socialist society. Sign up at the FB event page. "Workers' Struggles Have No Borders"
Please contact contact@rdmnetwork.org for more information or for your organization's endorsement. Sponsor: Resist the Deportation Machine Network. For more information call 504-520-9521. We are writing to strongly urge you as members of the Essex County Board of Chosen Freeholders and as County Executive to immediately act to end the contract with the Immigration and Customs Enforcement agency (ICE) to hold 850 immigrant detainees at the Essex County Correctional Center in Newark. ICE’s detention centers throughout the country are a crucial part of its cruel and illegal deportation machine that is spreading terror and disrupting the lives of millions of immigrants. Without ICE’s ability to hold up to 41,000 immigrants in detention, it would be impossible for it to deport the 400,000 or more immigrants per year it is now expelling. Most of the 100 detention facilities are, like the Essex County Correctional Center, leased from local authorities. Shutting Down detention centers will force ICE to free immigrant detainees. The ICE system is full to capacity, and ICE is requesting Congress authorize 5,000 more beds. Detainees that are no longer housed at ECCC can’t, in general, be moved elsewhere because there is no room for them. ICE will have to release many of them. We are as well demanding that Hudson County and Bergen County close their detention centers and we expect that shutting down one of these centers will inspire other campaigns throughout the country. Multiple shut-downs will cripple ICE’s entire deportation operation, preventing ICE from simply moving detainees around. In 2006, the closing of the Passaic County immigrant detention facility in Paterson led to the paroling or outright release of over 140 detainees. Immigrant detentions are unconstitutional and a threat to the rights of all. By ICE’s own admission immigrant detainees are "administrative detainees" who have not been charged with or convicted of a crime. Their detention—really imprisonment under a different name—violates the basic protection of the Bill of Rights that no person is to be deprived of liberty without due process—indictment and trial by jury. Deportations and Detentions Undermine All Workers’ Rights. The threat of arbitrary detention and deportation deters many immigrants from defending their rights to decent wages and working conditions. This hinders the ability of all workers to defend these rights. Essex County Must not Run on Blood Money. The fact that the county profits from the unconstitutional detention of immigrants, because ICE pays for the beds, is not a valid argument for collaborating in the ICE deportation machine. The County could raise money by selling opioids as well, but that would not make it a wise policy. Therefore you should act now to immediately end the detention contract with ICE. Equal Rights For All Who Live Here! Make Newark a Real Sanctuary City! 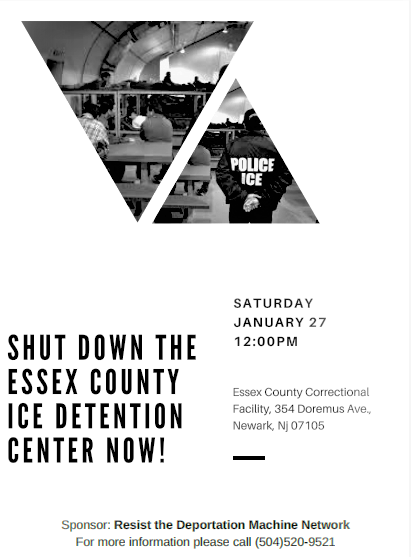 Close the Essex County Immigrant Detention Jail NOW! The detention of immigrants, who are not being held on criminal charges, is a clear violation of the Bill of Rights' guarantee that no one is to be deprived of liberty without a criminal charge. The ICE deportation and detention system can only function with the cooperation of local authorities. The fewer places available for ICE to hold detainees, the fewer detainees will be held. How Do We Defeat Trump? Which Way Forward on Elections? Please come to a meeting for all NJ activists to discuss. Please circulate this call widely. "No Hate, No Fear, Everyone is Welcome Here!" This chant, popular at the many airport demonstrations against Trump's Muslim ban, embodies the real alterative to the ban—Freedom of Movement, free immigration, for all. The alternative to Trump's naked discrimination in immigration is not a return to the disguised discrimination of existing immigration law. The only way to protect the rights of all is to defend the freedom of movement of all—guaranteeing to all the right to chose where they live. That is the only policy that can protect the rights of working people everywhere. When the Movement for Socialism demands "Equal Rights and Citizenship for All who Live here" we don't mean—just those living here today. We mean welcoming everyone who chooses to come here, in the past or in the future. That was, after all, the original "immigration policy" of the United States. Up until 1879, it was the policy of the United States to, in the words of an 1868 treaty between the US and China, "recognize the inherent and inalienable right of man to change his home and allegiance, and also the mutual advantage of the free migration and emigration of their citizens and subjects, respectively, from the one country to the other for purposes of curiosity, of trade, or as permanent residents." The mass actions against this ban can be the first big step in building a unified movement for all our demands, not just against a particular executive order. Defending the right of all who live here and all who come here is part of defending the equal rights of all, whether they be immigrants, racial or ethnic minorities, women, gays, disabled , union members or whatever group Trump and the capitalist system singles out. The demand unifying all these struggles is "Equal Right and Citizenship for all who live here.!" But to welcome all to live where they choose is to provide enough education, housing, transportation, medical services and energy for all. So our demand for a massive federal project to expand these vital services so that they can be free for all is vital to a coherent program that guarantees freedom of movement. Without such a demand, we can't counter the virulent idea that we must fight each other over the crumbs left to us by the capitalists. So, to defend basic rights, we must demand that we all get—free, as a right—the housing, education, transportation, health service and energy that we need. Unite in Defense of immigrants and all workers! The widespread protests against Trump can become a powerful defense of all our rights-- if we can unite. 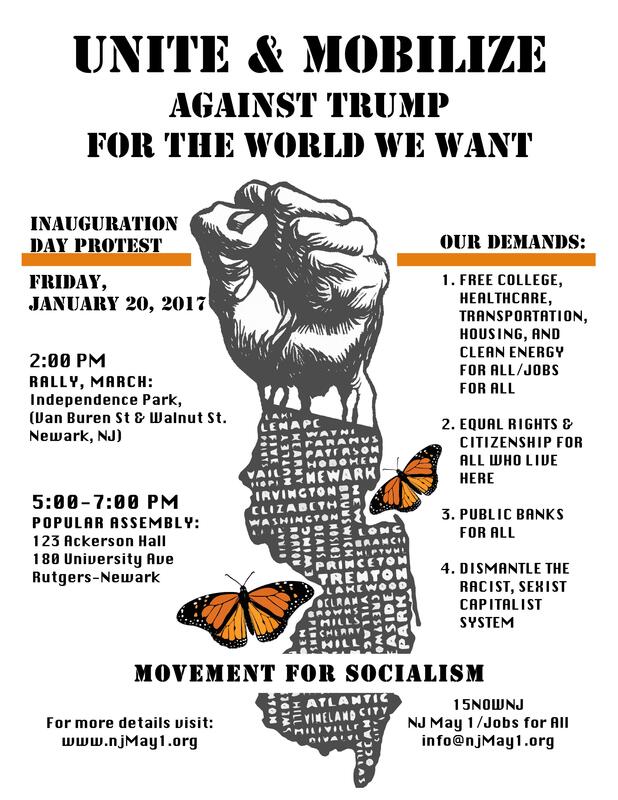 Right now, in the two months before the inauguration, we can mobilize effectively to defeat the new administration's attack on immigrants, and on the entire working class. The first step is to bring together various groups to arrive at common plans of action and common demands. It is particularly urgent to make concrete plans to defend against and block any new escalation of detentions and deportations. At the same time we must discuss the formation of a real political alternative to capitalist attacks. At the last meeting we formed three committees, including the January 20 inauguration day action committee, the Rapid Response Immigrant Defense Team Plan committee, and the NJ coalition building and outreach committee, all of whom will be reporting back at the next meeting. We got off to a great start last week, but we need to do further outreach to our friends and contacts to expand the movement and build a real political alternative. The first meeting was sponsored by NJ May 1/Jobs For All. As we discussed on Saturday, if your group would like to be a co-sponsor of the meeting, please send us your group's name. We plan to make a facebook page and flyer advertising the meeting and will include all the sponsors. Please come to a meeting for all NJ activists. Please circulate this call widely. Mobilize! In defense of immigrants, for an alternative to capitalist politics. The surprise victory of Trump signals a new level of assaults on immigrant workers in the United States, and through them, on the entire working class. It reveals the inability of the Democratic Party to function even as the "lesser evil" illusion so dear to the hearts of many on the left. To activists, this outcome poses the danger of escalating racist assaults, but at the same time the potential for a massive counter-mobilization and for the initiation, at long last, of a real alternative to capitalist politics. Trump's behavior is erratic, but there is little reason to expect he will hesitate to fulfill this particular election pledge, which involves no conflict with competing capitalist interest, unlike his trade-war vows. An all-out assault on immigrants would in fact befit wide swaths of employers by creating an increasingly desperate work-force. The DACA program was won by a political mobilization of immigrant youth. There is every reason to believe that this coalition and a much broader one could be mobilized to fight ALL deportations. The spontaneous anti-Trump demonstrations, while unorganized, are evidence of the determination of people to act. What is needed is not a national mass demonstration, which can easily be ignored, but mobilization on the ground, locally and regionally to physically block detentions and deportation, as was done successfully in the Southwest in recent years. As mass mobilizations of abolitionists nullified Fugitive Slave laws in New England before the Civil War, so mass mobilizations today must nullify any attempt at mass detention. The time to mobilize is NOW, in the two months before Trump is inaugurated. Immigrant rights, civil rights, peace, African- American and other organizations must as soon as possible set up meetings everywhere to plan Rapid Response Networks that can mobilize to block detentions and attempted deportations. ALL detentions and deportations must be blocked. When confronted with resolute opposition, Trump has shown that he will back down. But any response to attacks on immigrants will have only limited and temporary effects unless at the same time we start NOW building a broad alternative to capitalist politics and power. The working class sorely lacks any effort to build a party the represents its interests not just at elections, but year-round, bringing the same program to every battle, in every place mobilizing the broadest layers in defense of common interests. In the face of capitalist racism, bigotry and misogyny, we need a PARTY FOR ALL . A democratically-controlled federal public works and public service program to provide free education(through college), healthcare, housing, transportation and clean energy FOR ALL through direct government employment with good wages and reduced hours. Fund the program by taxing the wealthy and corporations, slashing weapons spending and ending US wars and occupations. Through this program, provide jobs and training FOR ALL who want them, including all immigrants and the formerly incarcerated. Legalization FOR ALL who live here, equal rights FOR ALL, include the right to vote. End all deportation and detention without charge. End mass incarceration. Unconditional defense of the rights of women to control their bodies, and of the rights of all, regardless of race, religion, or any other distinction. Unlimited right to unionize, organize and strike. It is not too early to begin building such a movement-based party to run candidates in state elections in 2017 and nationally in 2018. It is not too early to connect every struggle to a common program. Is this realistic? We must make it reality. What is not realistic is to continue to rely on the Democrats. ECONOMIC, ENVIRONMENTAL AND RACIAL JUSTICE! LOOK LIKE IN THE NY METRO AREA? HOW CAN WE WIN ONE? Help us to start planning a 2015 'Jobs for All Conference' in the New York Metro Area! Contact us at info@NJMay1.org so we can let you know of our next planning meeting. Torture, epidemics, police brutality, environmental disaster, unemployment and misery—we know what kind of world the rich have made with their system—a system based on greed. We need to fight for our world-- a world with jobs for all, housing for all, education for all, health care of all, transportation for all, with a clean livable, sustainable climate and environment, with clean cheap, safe and unlimited energy for all. Another World is Possible! As a first step to that world, we need a massive Public Works and Public Service program, with direct government employment. Help us plan a two-day conference to discuss and learn what such a Jobs for All program would look like in the New York Metro Area. How can we build the schools, hospitals, and housing we need, get to 100% clean renewable energy and provide good-paying jobs for everyone who needs them? Just as important, let's decide the next steps in building a movement powerful enough to sweep aside the thieves, killers and torturers, from Wall Street to Washington, and to win such a massive program, a movement powerful enough to win Justice for All. 1) Jobs for All Public Works/Public Service Program with direct government employment, open to all who live here. 2) Finance this program by taxes on the rich and corporations. 3) Build a mass movement entirely independent of the two parties of the rich—Democrats and Republicans. We demand that federal government create a democratically-controlled public works and public service program, with direct government employment, to generate millions of new jobs at a living wage. The new jobs will be to build the facilities and provide the services to create free quality public services needed to meet the needs of the 99%, including in education (through university), child care, healthcare (single payer), housing, transportation, and clean energy. and by ending all U.S. wars and occupations and redirecting those military expenditures to meet human needs. Employment in the program will be open to all, including all immigrants and persons formerly incarcerated, and workers will have the right to unionize and to strike. Training will be provided to guarantee access to all jobs. We demand a democratically-controlled public works and public service program, with direct government employment, to generate 25 million new jobs at good union wages. The new jobs will be to build the facilities and provide the services needed to meet the needs of the 99%, including in education, child care, healthcare, housing, transportation, and clean energy. The program will be funded by raising taxes on the financial sector, corporations and the wealthiest 1%, and by ending all U.S. wars. Employment in the program will be open to all, including all immigrants and persons formerly incarcerated. May Day Tuesday May 1, New York and Newark NJ Rally and March for JOBS! New York: Demand Jobs for ALL! Newark: Rally 4:00 PM West Market and Springfield to Demand a National Jobs Program! One hundred activists, students, trade unionists and immigrant workers rallied in Newark's Independence Park on Sunday to demand Jobs for All-- a Massive Public Works Program and Legalization for All. 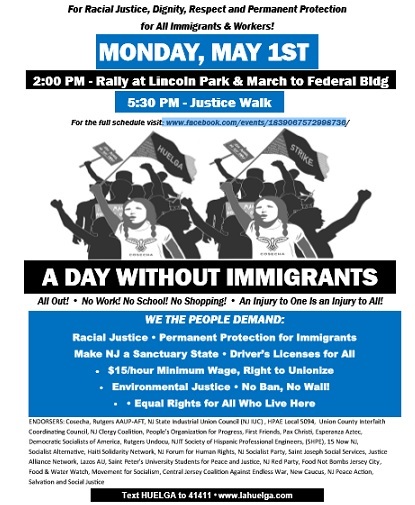 The rally, conducted in English and Spanish, was part of nationwide May Day protests including a march of 60-100,000 people in Milwaukee, Wisconsin. Most of the rally participants were immigrants from the Ironbound neighborhood where the rally was held, but others came from the sponsoring organizations--NJ Immigrant and Worker Rights Coalition and Peoples Organization for Progress as well as from unions that had circulated the rally call, including the Newark Teachers Union and AFSCME. Maria DaSilva told the rally about her initiative, supported by NJIWRC, to start a class-action lawsuit to challenge the constitutionality of the US immigration laws. Her husband faces deportation, yet the US constitution does not grant to Congress the power to exile residents without charge or trial and nowhere gives Congress the power to make it a crime to be born elsewhere. Eric Lerner spoke on the necessity for a public works program, paid for by ending the US foreign wars and taxing the rich and the corporations. To build the unity needed to win such a program, we must fight for legalization for all, he said, so that all have the right to work. POP Chairman Larry Hamm described the struggles, including the civil rights struggle that had been won through mass mobilization. He urged the organizing of a permanent, daily protest rally in Newark to win our demands, a proposal under discussion in POP and which will be discussed by NJIWRC as well. Folk singer Graciela Barreto performed at the rally. Her songs and message of liberation and struggle, drawn from a rich Latin American musical tradition, including artists like Violetta Parra, Victor Jara, and Ali Primera, were well received by the crowd. While the turnout was about the same as the May Day rally in Newark last year, several participants expressed disappointment that more trade unionists did not participate this year. Some said that mobilization by the same unions for the New York City rally could have been a factor. Further discussions will help to determine how greater union participation can be mobilized in future events. Many participants, who had heard about the campaign for Jobs for All, Legalization for All for the first time at the rally, were eager to participate further. The next NJIWRC meeting, announced at the rally, will be Sunday, May 15, 3:00 PM at 187 Lafayette St, Newark. Agenda topics will include the campaign to force employers to pay back stolen wages to day-laborers and possible daily rallies in Newark in alliance with POP. Also announced at the rally was a lecture/discussion on the battle for a jobs program in the 1930's and the sit-down strikes of 1936-37. The lecture by independent historian Jeannette Gabriel is sponsored by the International Luxemburgist Network and will take place on Sunday, May 22, 4:00 PM at 187 Lafayette St., Newark. It will be conducted in English and Spanish. Today, one in six Americans is unemployed or underemployed, and one in four is among African-Americans and Latinos. Public workers are under attack and education, health and other vital public services are being slashed. Today, there is only one way to create jobs'the government must hire workers directly at good pay to do the work that needs to be done. The public sector needs to be vastly expanded, not cut! We invite you to this important meeting. Last fall, the coalition came into being and adopted two key demands: Jobs for All—A Massive Public Works Program and Legalization for ALL. At our state-wide conference in February and at our regular meeting, we have discussed at length what the meaning of these demands are. Now, after this thorough discussion we want to decide definitively if these are to be our demands permanently—until they are fully met. So we will vote again on these demands and give all the opportunity to propose changes. At the same time, demands have no meaning unless they are backed up with growing action and organization. So after voting on the demands we will plan concretely how we can publicize and build for the Independence Park rally May 1, which has now been endorsed by the People's Organization for Progress. With the public workers in action defending their rights, we have a historic opportunity to bring together the movement for immigrant rights, the movement to defend the public sector, community, peace and environmental groups who all can join in our common demands. Please come to this important meeting to decide the next steps in the battle in NJ for immigrant and workers rights. Don't let Wanderson DaSilva be the Next Victim of Injustice! US Immigration laws are unconstitutional! Nowhere in the Constitution is Congress given the right to condemn people to exile just for the 'crime' of being born elsewhere. No law that Congress has passed makes being here without proper documents into a crime. And if it were a crime, defendants would have the right to be tried by a jury of their peers. Instead ,today, an unconstitutional 'administrative process' condemns people without charge or trial to imprisonment or exile for 3 or 10 years, separating families and destroying lives. The basic rights of due process under law are denied both to immigrants and to their citizen families. We are organizing a class action lawsuit challenging the constitutionality of this law. We demand that these unconstitutional laws be struck down! Due process for all! Legalization for all! Join us! More than two years after the crash of '08, one in six Americans is unemployed or underemployed, and one in four is among African-Americans and Latinos. Employers are slashing wages with some workers suffering pay cuts of 50%. The intensified campaign of terror against immigrants is forcing millions to work at sub-minimum wages, accelerating the employers' race to the bottom. Across the country, state governments are taking an ax to public employment and vital public services, such as education. Around the world, the same things are happening. We face a global crisis that threatens an unending spiral of unemployment, wage cuts and austerity, the destruction of our lives and our future. But there are solutions and we must organize ourselves to fight for them and win them. There is work that needs to be done—lots of it. The money is there—the corporations announced record profits this quarter. The NJ Immigrant and Worker Rights Coalition, joining with other organizations demands JOBS FOR ALL, A Massive Public Works Program. Have Your Organization Endorse the Jobs for ALL Demands! During the summer, the NJ May 1/Jobs for ALL Campaign is trying to get as many immigrant rights, community, student and union organizations to endorse the three demands we are organizing around: Jobs for All, Legalization for ALL, a Massive Public Works Program with direct government employment at prevailing wages. We think that, if we can get wider support for these demands, it will be possible to get the endorsing organizations involved in larger actions in the fall, such as a North-Jersey-wide rally and march. Members are now preparing a short pamphlet to explain the public works demand in greater detail. If you want a speaker to talk to your group about this campaign and endorsing these demands, please contact us at info@njmay1.org. Since the membership and goals of these two organizations complete overlap, we unanimously agreed that there is no reason to have separate names for NJ May 1 Coalition and Jobs for All Campaign. So we decided to merge them at our last meeting. We have also asked for any objection to merging these groups over the NJ May 1 email list and have received none. So for now, the merged organization will be called the NJ May1/Jobs for All Campaign. We will continue to use the www.njmay1.org website and njmay1 email list, but are changing the masthead on the website to reflect the new name. We decided on the somewhat long merged name because we want it to reflect our central campaign to get Jobs for All, Legalization for All and a Public Works program, but still retain NJ May 1, which has by now some considerable name recognition. The merged organization will continue to support the NY- NJ Rapid Response Network, which has long been the other main project of NJ May 1 Coalition. Legalization for all! No limits on the right to strike and organize. Workers can't fight layoffs, cutbacks and wage cuts if they fear deportation and detention and if laws block their rights to form unions and to strike. Tax the rich and corporations to pay for a massive direct government jobs program expanding housing, education, health services. Budget cuts, concessions by workers, layoffs all deepen the crisis by cutting demand for goods and services. No budget cuts! Instead we need to create jobs and expand demand by taking money from the rich, who created the crisis. Permanent government ownership and control of all banks and other financial institutions-- run by democratically-elected boards. Trillions for bank bailouts just gives money to the same bankers whose policies are gutting the economy. WE need to control the financial system, not leave it in the hands of a pack of billionaires. The people must vote on where we put our own tax dollars. How can we win these demands? The same way people in the last Great Depression won Social Security, unemployment compensation, huge government jobs programs like WPA—by mass demonstrations, by General Strikes like those in San Francisco, Minneapolis and Toledo, by sit-down strikes (plant occupations) and by organizing everyone—fellow workers, neighbors, and friends. and we will let you know of others in your area and of local meetings and protests. The following has not been operational since 2008 but will resume operation in early 2017. The hotline phone number listed below does not work at the present time. However much of the documentation is valid and useful. In response to widespread immigration raids, a coalition of immigrant rights activists has announced the launching of a Rapid Response Network Hotline that will give help to those confronted with the raids. The RRN Hotline, sponsored by the NJ May 1 Coalition and the New Jersey Civil Rights Defense Committee is a 24-hour toll free number covering New York and New Jersey that will provide immediate, contact with Spanish-speaking volunteers. In the event of a raid, the volunteers will calmly inform callers of their basic rights, especially the right not to admit the ICE agents to their homes without a warrant signed by a judge and the right to remain silent. The hotline number, for emergencies only, is 1-800-308-0878. March 14, 2008 Press Release announcing the RRN. Rapid Response Hotline operational, needs volunteers! On March 10, the Rapid Response Network hotline became operational in the New York-New Jersey region. Immigrants faced with ICE raids now have a 24/7 toll free number that they can call in an emergency, and get a Spanish-speaking volunteer who will be able to calmly tell them their rights and how they can avoid detention. Such Rapid Response hotlines, now being set up in other cites, have helped immigrants to fight back against the raids and break the terror that ICE is imposing on the immigrant community. The Rapid Response Network has already had its first successful response to a raid. A woman called the hotline from her home in Elizabeth, saying that ICE agents were outside, demanding to be let in. The RRN phone volunteer reassured the woman that she had a right not to let the ICE agents in without a search warrant. Although the agents were waving various papers around through the window, they did not show any such warrant.. After some 20 minutes, the ICE agents gave up. No was detained and the Hotline worked as intended. 1) If you are fluent in Spanish, we need more phone volunteers to cut down on the shifts. Volunteers will receive training. During an 8-hour per week shift, calls to the hotline will be directed to your cell-phone and you will be able to help immigrants involved in raids to avoid detention and deportation. Volunteers are confidential and status does not matter. 2) We need a lot of help in getting the word out to the Spanish-speaking immigrant community. We have eye-catching posters in Spanish and English which we need to get to organizations and individuals that can put them up in immigrant neighborhoods. We need help in printing lots of the posters. 3) You can join Rapid Response Teams who, when called by hotline volunteers, rapidly go as teams to the site of an ICE raid and act as witnesses. RRT witnesses will also receive training. As experience in LA and other cities has shown, the presence of such witnesses can deter ICE agents from rights violations (like breaking down immigrants' doors). Rapid Response Team members do not need Spanish, but since they will be dealing with ICE agents, they must be citizens, permanent residents or on a valid visa. Observing and commenting on the actions of ICE agents or any other law-enforcement authorities is lawful activity protected by the Bill of Rights and by Supreme Court decisions. Know Your Rights (English), Know Your Rights (Spanish). Categories of Callers (English), Categories of Callers (Spanish). Description of the RRN (English), Description of the RRN (Spanish). Guidelines for RRN phone volunteers (English), Guidelines for RRN phone volunteers (Spanish). Guidelines of Rapid Response Team (witness) (English). Right to oppose or challenge (English). Referral numbers for social services.